Selena Lasota looks for a pass recipient. 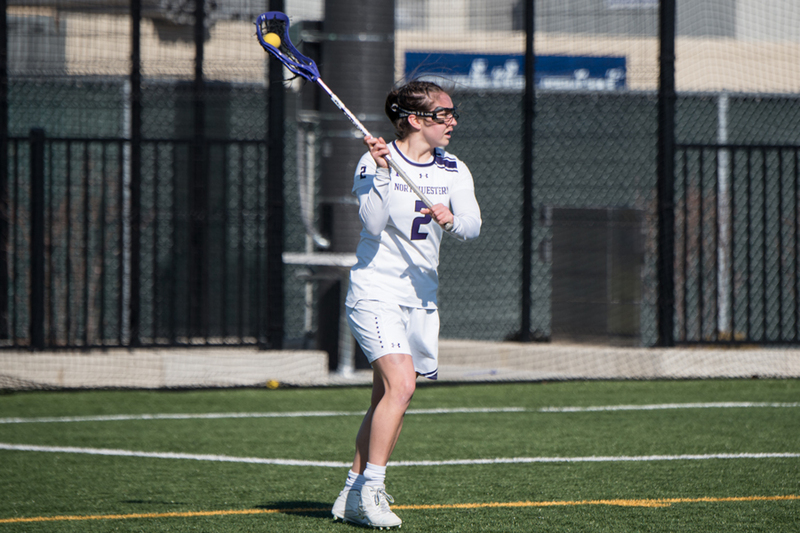 The junior attacker scored 5 goals in Saturday’s quarterfinal against North Carolina, but Northwestern still lost, 19-14. Goaltending made all the difference in Saturday’s NCAA Tournament quarterfinal between Northwestern and No. 2 North Carolina. The Wildcats’ (15-6) duo of redshirt freshman Julie Krupnick, who started and played the entire second half, and junior Mallory Weisse, who filled in for the struggling Krupnick for part of the first half, combined for just five saves on 24 shots on goal. The Tar Heels (17-3), meanwhile, rode a spectacular performance from starter Taylor Moreno: 17 saves on 31 shots on goal. The end result was a 19-14 win for host UNC at Kenan Stadium in Chapel Hill, North Carolina, ending the Cats’ season while sending the Tar Heels onto the national Final Four. Lasota did her part nonetheless. The junior from British Columbia buried a game-high five goals, upping her final season total to 75 — the most in a single season by an NU player since 2011. Her 22 combined scores in the Cats’ three tournament games also tied an NCAA record. But four of those five goals came in the game’s opening 14 minutes, as the two squads battled to a 6-6 tie. Then UNC’s defense adjusted, double- and triple-teaming Lasota defensively, while its offense kept up its pace, pulling the hosts ahead 11-8 at halftime. Senior midfielder Sheila Nesselbush, the other half of the Cats’ pair of leading scorers throughout the year, was held to one late, irrelevant goal. NU had fought back to trail 13-11 early in the second frame and, after Lasota’s fifth strike of the afternoon, 16-13 with still almost 7 minutes to play, but gave up a late run to put the game out of reach. Although the Cats advanced farther into the postseason than they have the past two years, the team was still denied a chance to go to the Final Four for the first time since 2014, largely due to Moreno’s heroics. The UNC goalkeeper’s 17 stops, highlighted by several point-blank robberies late in the first half, were three more than any other goalie had registered against NU since Canisius’s Rebecca VanLaeken in the season opener. The loss ended the collegiate careers of 10 seniors, including six of the team’s 11 starters in Saturday’s game: attackers Fredericks (team-high 50 assists), Nicole Beardsley (19 goals) and Danita Stroup (31 goals); midfielder Nesselbush; and defenders Lindsay Darrell (team-high 26 caused turnovers) and Ally Mueller (started all but one game). Despite the undesirable conclusion to the spring, Fredericks said the team’s substantial improvement this season makes her proud of the impact her class made.